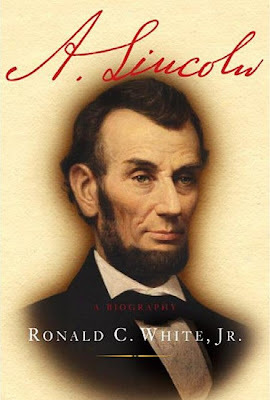 This last week I finished listening to A. Lincoln: A Biography by Ronald White. This particular audiobook lasted 40 hours. This is the type of book I never would have finished if I was forced to read it with my eyes. Even if I'm only going on a 10 minute drive, I'll listen. Some people like to wait for big chunks of time, but I find that I listen frequently enough, that small chunks of time work just fine. Plus, 10-20 minutes here and there start to add up. My iPhone has a cool "repeat the last 30 seconds" feature which I tap twice when I start listening. That gives me a good rolling start into the new section. I got an AM/FM transmitter so I can listen through the speakers in my car instead of driving around with headphones on. I've heard the iPhone's audible app is pretty good. Though, for whatever reason, I've stayed with the built in iPod app. It works great for me. Wait. What was the point of this post? Oh yeah. This biography on Lincoln is awesome. It starts with his parents and goes all the way through his death. You get to see is character develop as a youth. Then witness his presidential election win. The way he got nominated was brilliant too. It was a similar "delegates set-up" as today, but they kept voting round after round after round until someone emerges with the majority of delegate votes. Lincoln asked each delegate to vote for him second if their favorite candidate clearly wasn't going to win. So, at the beginning Lincoln was way behind. Then, as others dropped out, Lincoln started gathering those votes. As more dropped, Lincoln got more votes. Eventually, his win became inevitable. Brilliant. As you probably remember, it was during his presidency that the US had its civil war. This book goes into great detail of these events from Lincoln's perspective. For example, Lincoln originally asked Robert E. Lee to lead the Union army. Lee said he would think about it, and then a week later was announced as the leader of the Confederate army. For almost 3 years Lincoln struggled to find a commander who was even close to Lee's genius on the battle field. If it wasn't for the shear number of people the Union army recruited, the Union would not of won. Another amazing aspect was listening to his speeches and his logic. Lincoln really had an excellent grasp on America and what it represented. It felt like Lincoln was really coming into his own those last couple of years too. When he died, the civil war had just been won and he has just been re-elected. Given how delicately and masterfully he handled the political landscape during the war, it would have been amazing to see what he could have accomplished the next four years during the transition away from slavery. If you're into American history, this book is definitely worth reading.